The children were very excited as they set off for Marrick Priory this morning. The bus journey passed without incident although reports from staff say it was rather loud! After lunch the children completed some problem solving/team building activities (as can be seen from the photos below). 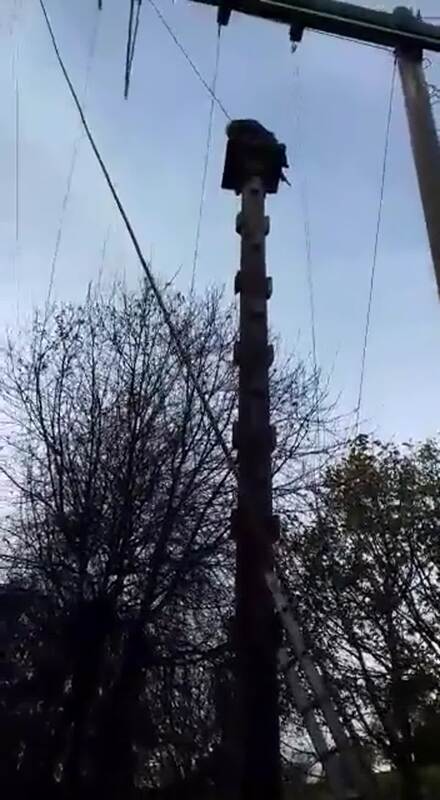 They were even preparing to drop eggs from a great height! This evening they will be going on a 'night walk'. Fingers crossed for good weather! Please watch this space for further updates, although please note that due to limited phone and internet signal these may not be as regular as we would like! A photo from last night's 'Night Walk'. The children were mesmerised by the stars! Following an early start (6:05am for some), the children were tasked with making their own packed lunches for the day. They then had a delicious breakfast before setting off on this morning's activities. Split into three groups, they were able to try their hand at Beck Scrambling (see Mrs Hirst below! ), Archery and High Ropes. 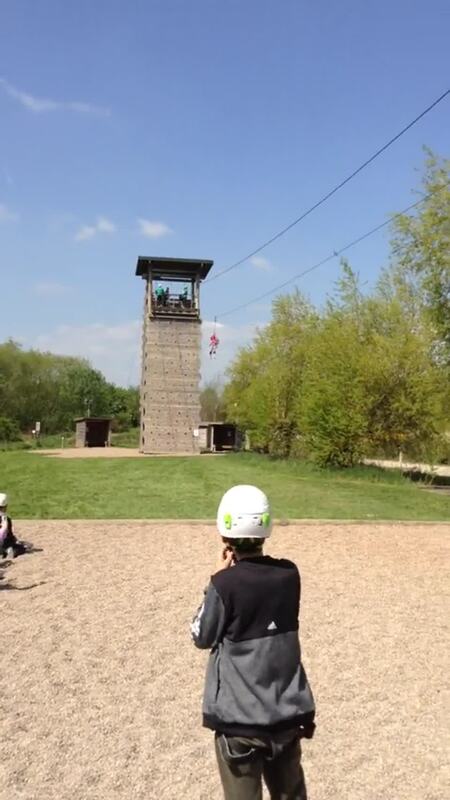 A very brave young man on the high ropes (below). He is one of many who had a go. The staff are really proud of every child - they have all joined in and attempted everything so far. Some photos of beck scrambling and archery.........a few very wet children! After the adventures of the day before the children had to be woken up this morning! Today's adventures include canoeing, climbing and abseiling. We spent the day walking in the dales, particularly around Swaledale. The views were absolutely stunning and we could see for miles around. We visited a disused lead mine, had lunch in a Hunter’s shelter and walked for miles, climbing stiles, crossing streams and climbing up and down rock faces. The children pushed themselves to keep going even when it was challenging terrain. As part of their 'Allotment' topic, Year 5 visited the Ledston Estate for the 'Countryside Live' event. They were fortunate to have a day of sunshine for this outdoor based event, where they learned the skills of beekeeping, weaving corn dollies and farming. The children thoroughly enjoyed the events of the day and all joined in with the experiences on offer. We have had a great first day at Kingswood. It's been both very busy and a lot of fun. We arrived on the bus and had our lunch, before being taken on a tour around the site so that we could have a good look at where we will be staying. After the tour we encountered our first challenge of the day. To work out how to make our own beds! Once we had our rooms organised it was time to take part in our first activity.... ....'Orienteering!' We had a great time trying to read the map and find hidden codes all around the Kingswood site. Take a look at the photographs below. Our second activity was a bit scary for some of us, but we conquered our fears and everyone had a great try at the climbing wall. We were all proud of how well we did. It's been a great first day and we can't wait to find out what fun we will get up to tomorrow. It's been another exciting day here at Kingswood. We have had a great time exploring all kinds of new activities. We woke up nice an early as we couldn't wait to get going on the days new adventures. Strangely the adults didn't seem quite as keen to be up so early. After a tasty cooked breakfast, we were all ready to face the day. Our first activity of the day was 'Problem Solving' where we impressed our teachers with how quickly we learnt to work as a team. In 'Problem Solving' we had many different puzzles to solve through team work and communication. Take a look at what we got up to in the pictures below. In 'Laser' we had to work as a team to score points by hitting the targets on our opponents hats using special laser guns. We enjoyed exploring the exciting indoor landscape to find the best spots to hit the other teams targets, without them being able to hit ours. 'Aeroball' was a fun mix of basketball and tennis which you play whilst bouncing on a trampoline. We had great fun taking on our friends in a competition to see who could score the most points. After a tasty and very much needed lunch our next activity was called 'Night line.' We weren't sure quite what to expect from this activity, but soon found ourselves blindfolded and being led on a long trail with lots of twists, turns and exciting obstacles to overcome. This was all really tricky to do without using our eyes to help us, instead relying on touch to guide us along the course. Mrs Hirst even came along and joined us on this activity. Our last activity before tea was archery. We learnt the correct way to hold and load a bow and really enjoyed the challenge of hitting the target with our shots. We even had an archery competition to show off our new skills. To finish off the second day fun, we spent our evening enjoying a disco. We loved dancing to the music and showing off our very best dance moves. The disco was great fun and gave us the perfect chance to celebrate our second day as well as the birthday of our friend Alex. As a special treat we even had a piece of birthday cake. Happy Birthday Alex! It's our last day tomorrow but we have lots more fun to go, so now it's time for a much needed rest!. It might have been the last morning of our visit, but before we made the journey back to school there was still a lot of fun to be had. After another tasty cooked breakfast we were off on our first activity of the day 'Bushcraft.' In this activity we were shown some of the skills we might need to survive in the woods. The first part of the activity showed us how to build and light our own campfire. We were taught that fires need 3 things fuel, heat and oxygen. For the fuel part we were taken into the woods to search for dry sticks and leaves to use as kindling. For the heat we took turns to try using a fire steel to create the sparks we needed to start a fire. It was much harder than it looked. Once we had ignited a small fire we used the rest of the kindling to try and keep the fire burning, taking care to not smother the flames so that the fire had the oxygen it needed to burn. The second part of the activity taught us how to make two different kinds of shelters. Group 1 worked together to build an A frame shelter and Group 2 built a Lean to shelter. We had to work together to carry the logs to build an effective shelter to protect us from the wind, rain and sun. Our final activity was one of the most exciting that we had taken part in during our stay. The Zip Wire! We first had to put on safety harnesses before taking turns to climb to the top of a tall tower. Once up here we were safely attached to the zip wire. Next came the scariest challenge we had faced, stepping off the platform so that we could enjoy the ride down the cable to the ground. It might have taken some of us several tries, but we faced our fears and feel very proud of ourselves for taking on the challenge. We may have come home dirty and we may have come home tired, but we have all had an amazing few days away.